Jeez, that Beatles song will definitely be running in your head while walking in Strawberry Farm in La Trinidad, Benguet. 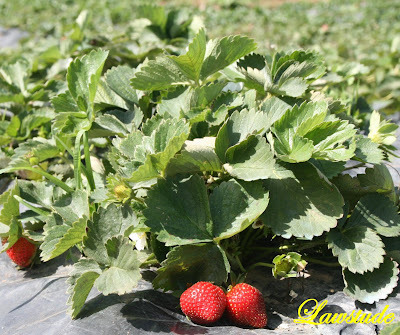 Baguio City is famous for fresh, sweet and delicious strawberries. However, these berries are not grown in Baguio but in its adjacent municipality of La Trinidad. 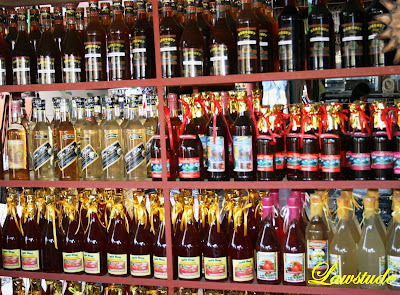 Other than the fresh strawberries which you can personally pick from the field, tourists can also purchase several strawberry products like wines, jams and preseves. And here is a nice fact: La Trinidad is in the Guinness Book of World Recordsfor having the "Largest Fruit Shortcake”. 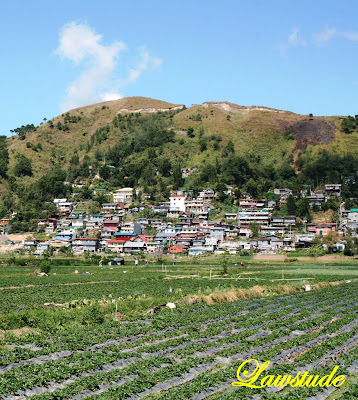 So, when you go up to Baguio, take a short trip to La Trinidad and more particularly in its famous Strawberry Fields. Who doesn't want to be there? um um ...not me. Wow, strawberries! Just in time for Valentines' Day! 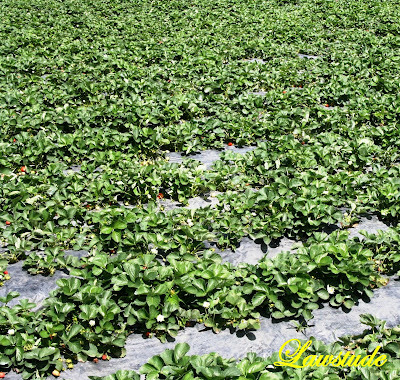 :D Panagbenga festival is coming soon---a good opportunity to visit the strawberry fields. Thanks for sharing. That's a lot of strawberries ... I just love to eat them. What a delight! I love strawberries. Some people like to dip them in chocolate or even sugar but I like mine natural. Yummy, makes my mouth water looking at them. thanks a lot for sharing these, lawstude..! Now i'm curious about strawberry wine, didnt knew that exists. @ reign - warm rays of the sun is a welcome feeling to the general coolness of the place. @ luna miranda - yup yup. see u all in panagbenga. 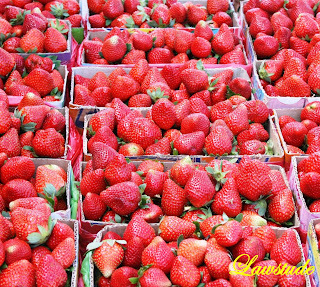 @ quintarantino - don't you just love the sweet and sour taste of strawberries? yum yum. @ andrea - i usually put milk, bits of cheese and cream in it then frost it overnight. a very nice dessert. 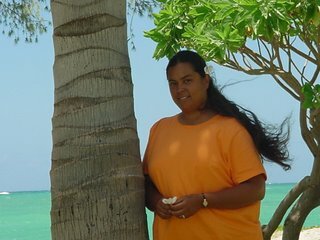 @ shades - we each have our own special places. you got one good place too. thanx for sharing them also. @ uma pos dia - strawberry wine is somewhat sour and fruity, a very good combination for those meals with a bit of salt on it like steaks. @ carlotta - welcome back!!! strawberries in la trinidad are somewhat crisp and juicy. @ bakhrian - of course you can have some. just go here and ill give u some lols. enjoy. @ alexander - a trip to this place (baguio) is really not complete without a bite of strawberry. @ ferdz - definitely. a whip cream and strawberry syrup on top of the shake is heaven. i think the avatar is funny and a total opposite of me lolz. Wow, I did not know they have a strawberry farm there.But then my visit to Baguio was a long time ago. :) Those strawberries looked so fresh and red. Yummy. wow, strawberries and lots of 'em! now, we're talking! funny but i've always passed by la trinidad enroute to other places but never actualy stopped there. one day, i will, even just to take shots of the strawberries, gorge on the berries, or better, visit the farms! @ kegler747 - fave ko selecta strawberry ice cream. dati may sherbet pero wala na yata available ngayun. tnx for the visit carlo, ganda ng kuha mo sa cebu ah. @ alicesg - it's just about 20 to 30 minutes from baguio. i had the time of my life eating the freshest strawberries there. @ my-so-called-quest - strawberry preserve na lang papasulubong ko kasi pag binaba na ang strawberry eh di na fresh, mabilis masira. @ lagalog - oggie, its a nice stop-over when you want to go further north. the farm is so wide and the people/farmers there are so friendly. @ bw - yup, the freshest strawberries in the philippines, in fact, you can pick 'em up yourself and pay for a basket full. I STILL have pot holders in the shape of strawberries that I bought there. Oh, and key chains! Great pictures! I love Strawberries and cream.. and this post as me wanting some. I will do... those strawberries look so yummy ! @ rochelle - almost every souveneer shops there has something that resembles a strawberry - Baguio's famous fruit. @ old tom wigley - glad this post made u crave for those delicious berries. tnx for passing by. @ sidney - other than strawberries, u can check their oranges. an orange weigh almost half a kilo, really big. I suddenly missed Baguio because of your photos! Waaaah! I used to visit Baguio even when I was travelling alone...love the strawberry fotos!